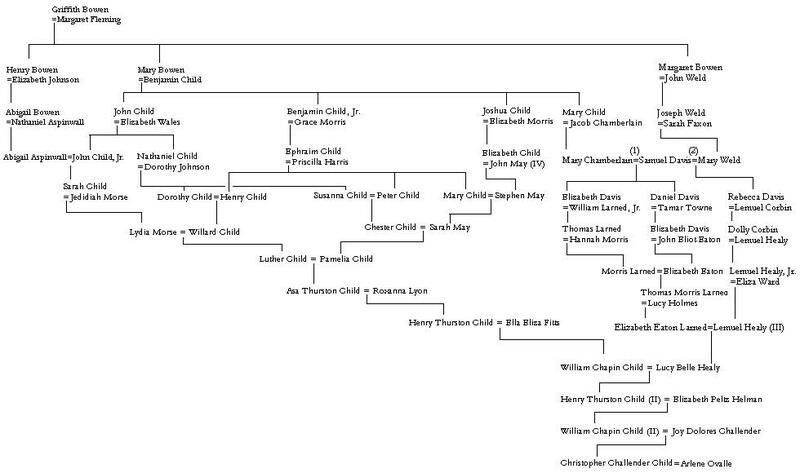 My great-great-great-grandfather Asa Thurston Child (1820-1860), through whom 7/10 of these Child lines, and 8/12 of these Bowen lines, descend. As I have mentioned in a previous post, my grandfather was raised in the northeastern Connecticut town of Woodstock, a town away from where I grew up. His ancestry can pretty much be summed up as “New England Yankee,” largely descending from families that arrived in Massachusetts Bay in the 1630s and 1640s. Settled by English people in 1686, Woodstock was originally called “New Roxbury,” after the town in Massachusetts from which most of the original English settlers migrated, and was part of Massachusetts until annexed by Connecticut in 1749. With a limited number of families to marry, this quarter of my ancestry features a large number of cousin marriages. 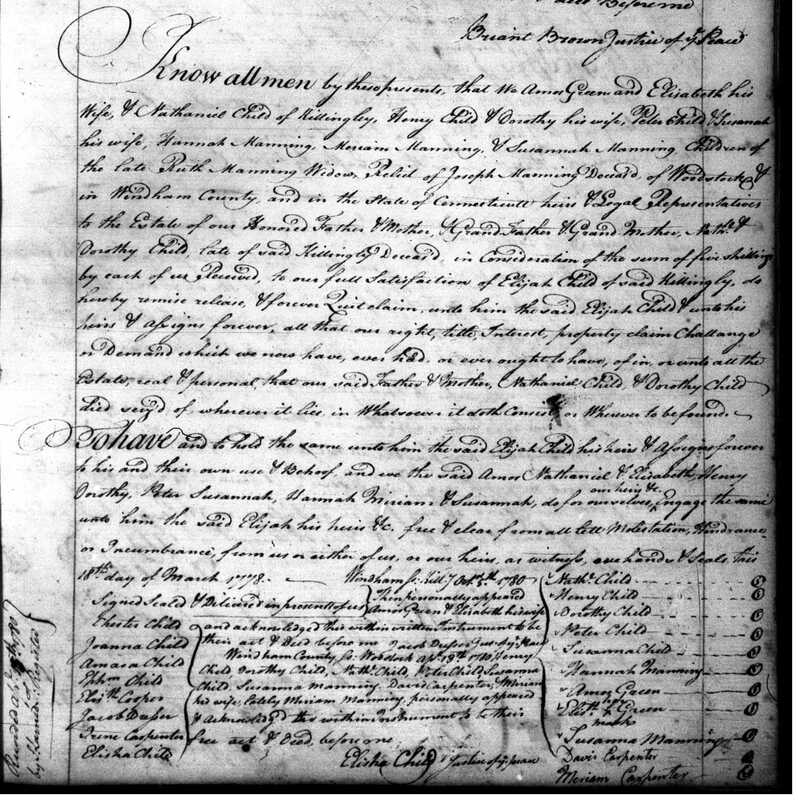 I have ten unique descents from my patrilineal immigrant ancestors, Benjamin and Mary (Bowen) Child of Roxbury, and twelve from Mary’s parents, Griffith and Margaret (Fleming) Bowen, also of Roxbury and Boston. While working on a case for Research Services, I encountered another Child family in nearby Killingly, which I knew to be my ancestors in one way – they turned out to be my ancestors a second time, something I could prove thanks to a very clear land settlement. This land settlement listed the heirs of Nathaniel and Dorothy (Johnson) Child, and two couples listed were my ancestors Henry and Dorothy Child and Peter and Susanna Child. However, it was actually Dorothy and Susanna who were the daughters of Nathaniel and Dorothy; Susanna had been given other parents in earlier works. Their husbands Henry and Peter Child, themselves brothers, were the sons of Nathaniel’s first cousin Ephraim. My great-great-grandfather, Henry Thurston Child, a family tradition claims, had had enough of so many Childs marrying other Childs, and found a wife in Pomfret (one town away). Years later they would discover they were third cousins through their common Kendall ancestors in Ashford, Connecticut. One hundred years later, I would discover another way they were related, as fifth cousins, through, you guessed it, the Child family of Woodstock! Chris – what is your Weld line? (8) Edwin Cecil Hoy m.Harriet Humphrey (her middle name) Tozier (9) Frank Tozier Hoy m. Mary Lorraine McCartney (10) my mother. Chris – intriguing to say the least. The DNA track would be a nightmare I would think! One question – what program or spreadsheet do you use to make such a beautiful chart? Thanks Sandy, I made the chart with Paint – I typed in the text and then drew in the various lines, etc., I have not found a program that can do something like that automatically! What methods do you use to determine which records belong to which individuals who share the same name? Chris, I’m guessing most of us with lots of 1620-1640 Great Migration ancestors have instances of “cousins marrying cousins”. A 5th great grandfather, Joshua Keene, born in 1730, has a common ancestor, Richard Warren of the Mayflower,on both his paternal and maternal lines through two different daughters of Richard Warren. What is the genealogical term for this? And am I correct that the more we research our family lines, the more likely we are to come across this occurrence? Love the chart, Chris! Thanks for the tip on how to produce one. I’d never thought of using Paint! 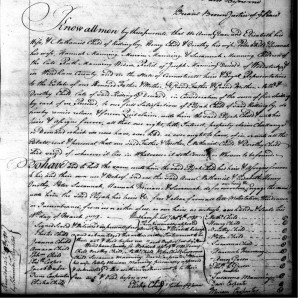 As for the cousins marrying same-name cousins phenomena in the early days of this country, I have a similar problem with a branch of WEAVER in RevWar PA. In the first instance, three daughters of one ancestress married three of her nephews, a sister’s sons. After that, family gatherings were little more than match-making events, compunded by repeatedly recycling first names over the next 200 years. Hence, I keep a giant bottle of Excedrin next to the computer when amending their records, but the relationship calculator in my genie program doesn’t have the option of “medicinal relief”, so always sputters and grinds in protest when calcing my relationship to the members of this bunch! Re your BOWENs, you have my sympathies. 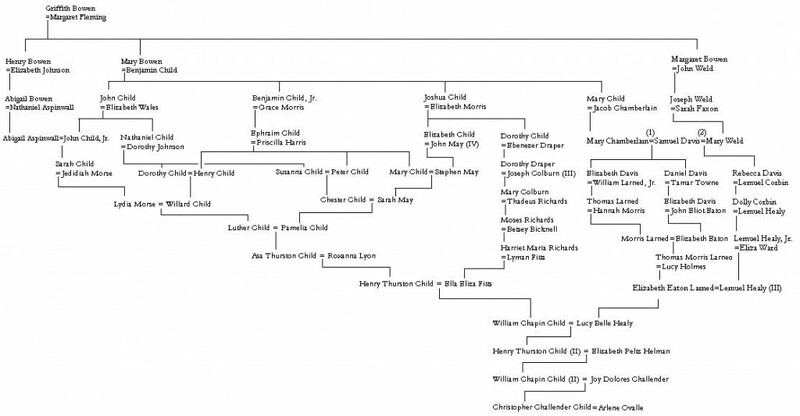 My HUSBAND line begins with William Husband (b. ca 1650, England) and wife Mary (b. ca 1957), whom Maryland records only identify as “the widow of Wm. Bowen”. I’ve combed early New England Bowen records, but William Bowen, whoever he was, remains a mystery, as well as the maiden name of my 7th ggm, Mary (–?–) Husband. I’m starting to really enjoy “the name’s the same,” problems. I worked on one for a project through my BU Genealogical Course this summer, and you’re so right, probate and deeds are extremely helpful in leading the way. The one I worked on was Samuel Morse of Natick (and Needham Leg) in the 1700s. He lived in the part of Natick that had been Needham and was called Needham Leg off and on for most of that century. I’m currently working on an “Alexander MacDougall” problem in Argyle, Washington County, New York. Five heads of household in this very small town carried this name in the 1830 Census. I’ve got my work cut out for me! I see the name Thurston (CT) and my mother had Thurston as a middle name and her mother (and supposedly her partents) were all born in CT is 1800s. Any info on Thurston? Hi Charlotte – Thurston is actually not a family name, my great-great-great-grandfather Asa Thurston Child was named for the Hawaiian missionary Asa Thurston (1787-1868) https://en.wikipedia.org/wiki/Asa_and_Lucy_Goodale_Thurston, Asa Thurston was born in Fitchburg, Massachusetts and his roots are in New England, but I have not worked on his ancestry. 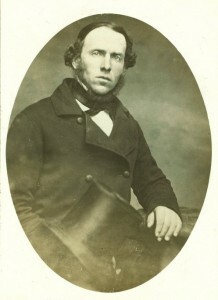 Thurston stays as a middle name in several branches of his descendants, some still living.